Leslie Thomas wants to shock you. She wants to anger you. And above all, she wants you to do something. She’s not talking about run-of-the-mill, “Hey buddy, watch your step” angry or TMZ sleaze shock. She’s talking about the great humanitarian and social crises of our time, like in Darfur, Afghanistan or Myanmar. And yes, she’s talking to you. Ms. Thomas, an architect turned activist, is the founder of Art Works Projects, which uses photography to raise awareness of human rights concerns and spur action. Over the last five years it has mounted exhibitions and presented large-scale public slide projections on various themes. It has now published a book of images with accompanying posters and curriculums on the lives of women in Afghanistan. A wide-ranging retrospective opens in Slovenia on Tuesday. Continuing reading about Leslie and her projects at the here! 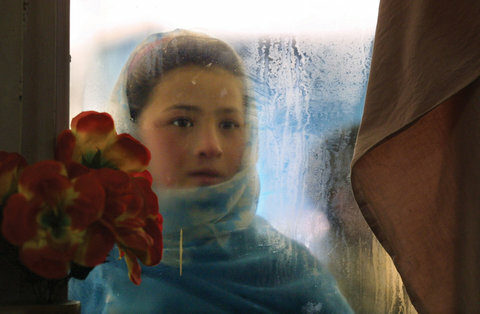 Switan, 10, looked into the window of a Herat restaurant. Kabul, Afghanistan, 2002.